Foodista | Mezan XO Rum and Q-Ginger Beer... My kind of Refreshment! Mezan Rum and Q-Ginger Beer. BRILLIANT!!! Q-Ginger Beer PLUS the addition of Mezan XO Rum is how I seek refreshment on a hot day. And if I'm on a sailboat being pitched around on a wild and wooly sea, well that activates history. Why history? Because back in the age of sail, ginger root would rot very quickly without refrigeration once cut. When it is boiled into a simple syrup with spicy chili peppers and added to fizzy water it becomes something otherworldly and indispensible when fighting sea-sickness. Now I'm not suggesting that you go out to sea to drink rum and ginger, but it wouldn't hurt! This cocktail made with authentic Jamaican rum and really spicy ginger beer speaks to another era, today! And when they are mixed with coconut water ice and perhaps some fresh mint, well- this becomes a drink that speaks an unfamiliar language that you suddenly have a mastery of. blend. A rum of this caliber deserves the highest quality Ginger Beer. Of course this would make for a cocktail that will shatter your preconceived notion that all rum and ginger cocktails are all meant to be sweet. Far from! Q-Ginger Beer is made with pure cane sugar instead of corn syrup. That alone is what should give you a basic idea of the quality of the product. They use the best ingredients possible! Q-Ginger is SPICY Ginger Beer from Brooklyn, NY. Handcrafted (like the Mezan XO Rum) in small batches, Q-Ginger Beer is authentic and boldly spicy in your glass. I of course am a long-time fan of this line of liquids, both the Mezan Rum and the Q-Ginger Beer. Together they are symmetry in a glass. I'm just fascinated with the Mezan Rum mixed with Q-Ginger Beer because of the level of authenticity in the flavors. Mezan is highly mixable and it brings all the ingredients together at an extremely high quality level. Making a craft cocktail with Mezan XO and Q-Ginger Beer is just the kind of thing that you want to make for myself and for friends. 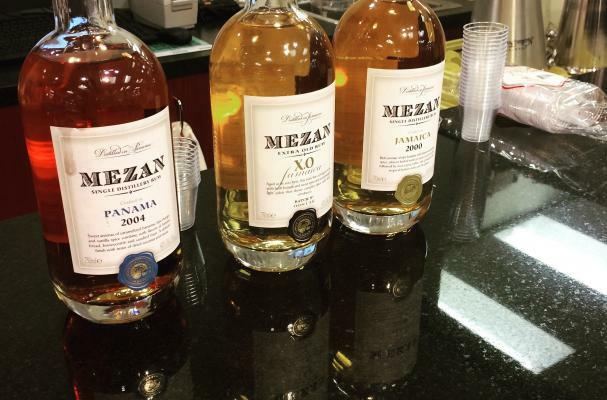 Mezan XO Rum when woven with Q-Ginger Beer becomes something unique and refreshing in a world heavily populated with rum from an uncertain provenance and manufacture. And speaking of the very best, I choose Q-Ginger Beer as my mixer when time is tight and speed is of the essence. I made some coconut water ice into this very easy to execute sipper. Freeze an ice tray with coconut water overnight in any shape you desire. I use the product with pulp for the most true to the original format of cracking open a coconut and pouring the liquid out. This is much faster without the risk to your thumbs from a machete! Garnish with fresh mint or citrus fruit.